Bumper-to-bumper traffic is the grist of everyday life. Getting cut off in traffic by whoever is almost inevitable and so is my less than charitable reaction. 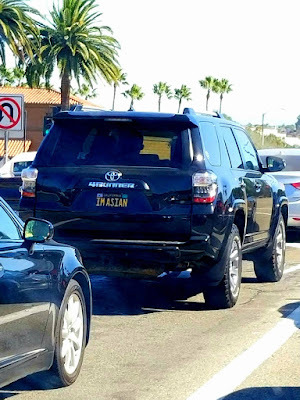 Having driven in Asia, some of my most florid invective is thrown out, accusing a driver as being from Asia -- or a blue-hair from Florida (retired, likely from NY, NY). The driving patterns are similar. I screamed at this guy, "Are you from Shanghai?" Then I saw his license plate. "Of course you are." In Tijuana, BC, Mexico, the driving patterns are more aggressive than they are in Asia. In Mexico, firearms are prohibited, which is why I've been shot at more there in Mexico than almost anywhere outside of a declared (sorta) and official war zone. Sometimes just a potshot at the car I'm in because of traffic, or because they can. It's Mexico. If you're driving in Mexico, best drive a total beater. They won't think less of you and when you're scraped in traffic you won't care - remember the old 'destruction derbies'? You take my point. Asians don't shoot in traffic in Asia. They just drive like Thais or Koreans or Chinese (except for Hong Kong where they drive very politely). I was always weirded out by driving from Laos (right side of the road) to Thailand (left side of the road) - yes like crossing from Hong Kong to the People's Republic of China. When you do that all of the time, it must cause something to snap. Retired blue haired ladies from New York City who can't see over the steering wheel don't shoot at you either, and they only know if they've hit something when their neighbor points out the dents, hair and blood in the grill, etc. after they get home. Driving in the mountains, you need to watch out for deer and elk. Yes, I have a "Roo Bar" on the front of my Toyota FJ and it will work defensively against deer, but I don't want to try it out on a 1,500 lbs elk. I have a friend of long standing (a nurse) who was at the concert at the Mandalay Bay with her husband when the shooting started. A guy took a round right through his melon (head) in front of her, and she's still distraught. While regrettable, she works in an ER and sees messed up people come in all of the time. She has accused me of being 'dead inside' because I suggested that she move on. Bad things happen. It's no worse than the traffic accident (and shooting) victims that she sees in the normal course of business. The difference, of course, is that this happened in an uncontrolled environment and not in the relative security of an ER. Will she get past it in time? Maybe not.